« Our Little Pepper is One! There are a couple of different types of kale varying in shades of green and even some with a little white and gorgeous purple color. If you mix different types together, you get a really pretty salad. 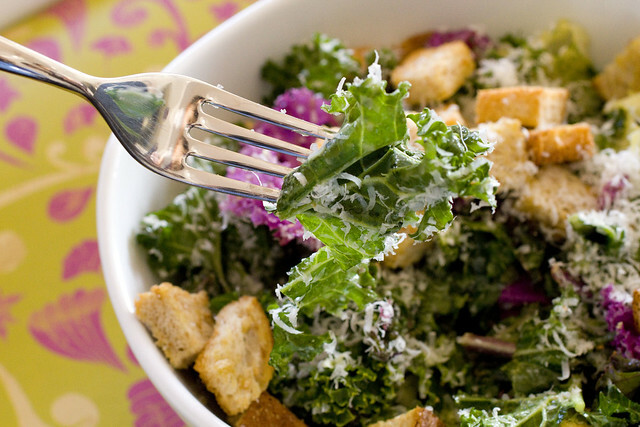 As with most salad dressings–and even more so in this one–use the best extra virgin olive oil you can find. When we ate at MP Taverna recently, we liked their olive oil and they told us they use Iliada Organic Kalamata Extra Virgin Olive oil available for a very good price on Amazon. The olive oil from Maiolino is astounding, incredibly buttery and rich. It is the Colombino from Terre Bormane and also available from Amazon, but more expensive. Both are great options. 1. Preheat oven to 350 degrees F. Combine olive oil and garlic in a small bowl. Let stand for 30 minutes. 2. 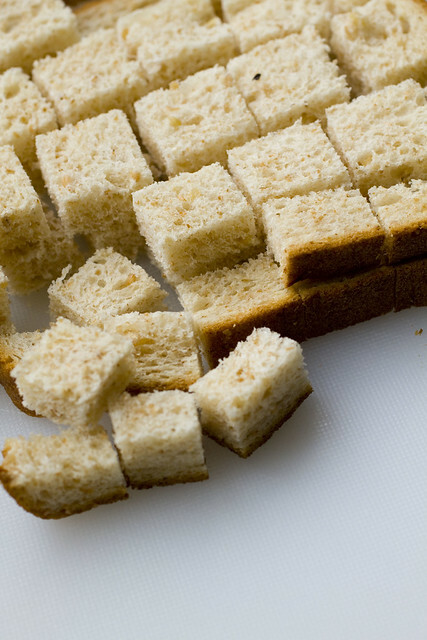 Cut bread into 3/4″ cubes. Take 2 teaspoons of the garlic infused olive oil and toss with the bread. Spread on a tray covered in aluminum foil in a single layer. Bake for 15 minutes or until golden. Remove and set aside. 3. Whisk together anchovy, egg, and remaining olive oil with garlic until it looks creamy. Whisk in lemon juice, salt, and pepper. Whisk in 3/4 of the grana padana or parmesan. Taste and add more lemon juice if needed. 5. Sprinkle remaining cheese on top. Top with croutons. Serve. posted by jessica	at 12:26 PM	Filed under American, Recipes. You can follow any responses to this entry through the RSS 2.0 feed. Both comments and pings are currently closed. Makes perfect sense, because anchovies are good with this kind of hearty green. It’s unique and oh so healthy. I just love the way the purple pops! 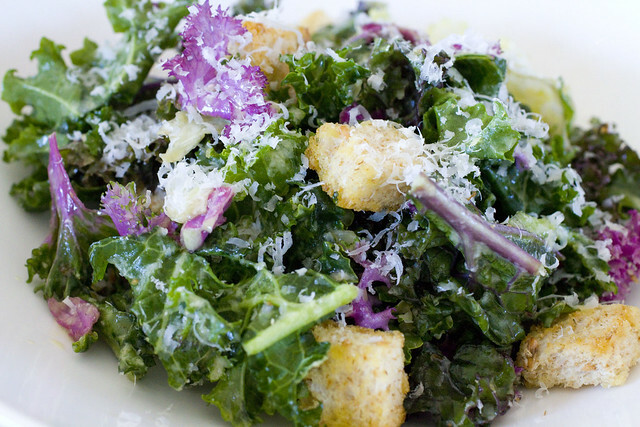 Can’t wait to try the croutons… we love croutons and whole wheat the better! Meg, yes! I’m in love with the vibrant purple!! You don’t need to get your mortar and pestle all fishy. Just put the salt and anchovies in your bowl and mash them together with a fork. The salt acts as an abrasive to turn the anchovies into paste and when you add the liquid the salt dissolves and disperses the anchovy into the dressing more effectively. A couple of dashes of Worcestershire helps and is traditional. Coddling the egg is also traditional and makes for a creamier dressing.